At our Mayo Clinic Social Media Residency, fellow faculty member Meredith Gould (who is a great humanitarian, by the way), shamed several of us for linking our Twitter profiles to LinkedIn, and for having Twitter updates automatically posted to our LinkedIn profiles. I think that for many of us for whom Twitter is our “mother tongue” among social platforms, having Twitter updates posted to LinkedIn is a way to keep our profiles updated without visiting the site. By checking the middle box, I could limit the Twitter updates going to LinkedIn to those in which I included the #in or #li hashtags. This seems like a good solution to me. If I think of LinkedIn while I am doing an update, I can just add one of those hashtags and the post would go to LinkedIn. If I forget about LinkedIn and don’t include those hashtags, I am essentially following the Meredith Mandate. What do you think? Is that a good solution? 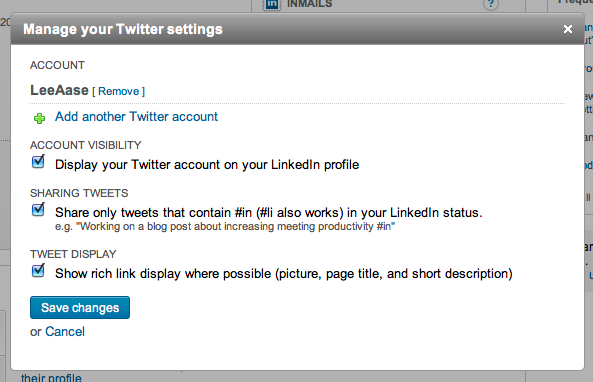 Did you also remove your Twitter linkage from LinkedIn? I’ve had my LinkedIn account configured to only display Tweets that contain #in or #li for several months now but as far as I can tell, my entire Twitter stream is still coming through. I’ll be interested to see if you have a different experience. Great idea. Hope it works. I think that’s a great idea and would, hopefully, appease Meredith. I do find that I mostly ignore those who autopost to LinkedIn (sorry). When the reposted tweets are not relevant, it’s obvious, and it doesn’t speak to the target audience. I believe Meredith alluded to this: your LinkedIn connections just don’t want updates about your personal life. It’s all business on LinkedIn. That said, I’m going to try the #in and #li hashtags as well to see if they work.